In light of its modern-day popularity, it’s hard to imagine a world without the Chihuahua. But determining where the breed first appeared has been difficult for historians and enthusiasts because of the folklore surrounding its heritage. Some say the Chihuahua descends from Mexico, while others trace it back to Egypt or China. Based on archaeological evidence including pottery and artwork, it is clear, however, that the Chihuahua’s earliest ancestors came from South America. This is supported, rather conclusively, by recent genetic evidence tracing the Chihuahua to Mexico. 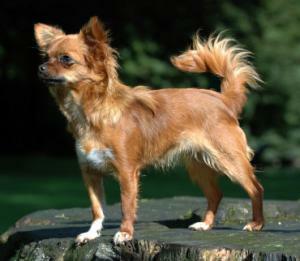 The name itself supports this; ‘Chihuahua’ is a place in Mexico and could potentially be the birthplace of the breed. Some sources claim it evolved from the Techichi, a small companion dog popular with the Toltec civilisation, while others believe its ancestors included the Mexican Hairless and, much later, the Chinese Crested. There is evidence to suggest that the Chihuahua, or Technichi, was once a larger dog, based on artefacts found during excavations throughout Mexico. These date as far back as the 9th century AD. Other items, including a wheeled dog toy resembling an early Chihuahua, artwork, pots and stone carvings all support such a history. Although there are no records of the Technichi prior to the 9th century, uncovered pottery from Colima, Mexico, depicts these dogs in abundance much earlier. It is quite possible that Chihuahuas were selectively bred as compact companions to the Toltec and Mayan people, who favoured their feistiness and protective instincts. These dogs were also easily transported and trained, had small appetites and long life-spans, which suited the civilisations of the time. Evidence suggests that the Chihuahua was originally bred as a consumable; however dogs soon progressed to figures of spiritual interest and were eaten less often by communities. The Chihuahua is believed to pre-date any other breed of dog in the Americas, meaning it could well be the original canine figure of worship. That said, folklore suggests these small dogs were often sacrificed at funerals to help guide the souls of the dead. Eventually, the Chihuahua made its way to Europe where it became a popular ladies’ companion and also came to symbolise the upper classes. Christopher Columbus is said to have favoured the breed, which is reflected in a letter he wrote to the King of Spain. Once in Europe, the Chihuahua was used for small game and vermin hunting, although its primary role remained as a companion dog. During the 1900s, the Chihuahua’s popularity dwindled for a time, as people favoured more utilitarian dogs that could pull carts, herd livestock, hunt and retrieve. The Chihuahua simply wasn’t the dog for the job and was seen as a luxury rather a working necessity. When people began moving to the cities in the 1960s, smaller dogs like the Chihuahua were desired once more, as people needed dogs that were better suited to household living. I am currently fostering a 'jackahuahua' -a Chihuahua x jack russell who has spent her 1st year of life in a shed on a rope. She was rescued when some lads were seen swinging her in the area by a rope round her neck. It has taken nearly 2 months to gain her trust but - as a big dog person - I am amazed by her intelligence, character and good nature.